Why you should read to your kids. I have a stack of books on the shelf already, awaiting Joshua's arrival. 7. 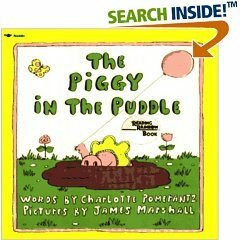 The Piggy in the Puddle! don't forget Mrs. Piggle Wiggle! I recommend anything by AA Milne, but especially his poetry books. He has such a way with the English language, that it is a joy to read aloud. Carrie, be sure to check out "Let Me Hold You Longer" by Karen Kingsbury and "You Are My I Love You" by Maryann Cusimano. Both are absolutely wonderful.